I've neglected my Hermes silk scarves in lieu of my cashmere shawls. I decided to reignite my love of these 90cm by 90cm scarves with slightly more edgy ways of wearing them. 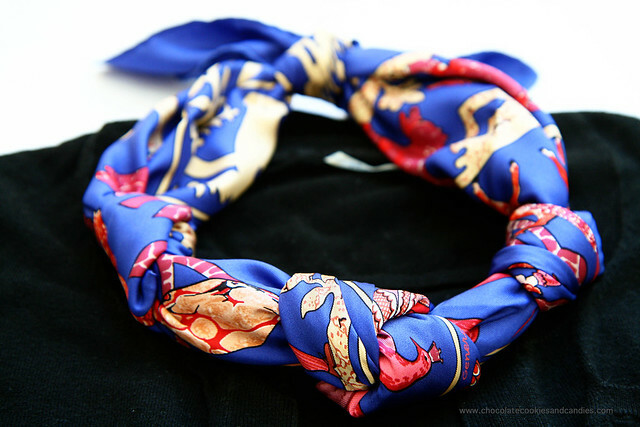 Why not turn the silk scarves into necklaces? You can twist and turn and within minutes, you've got yourself a new necklace. 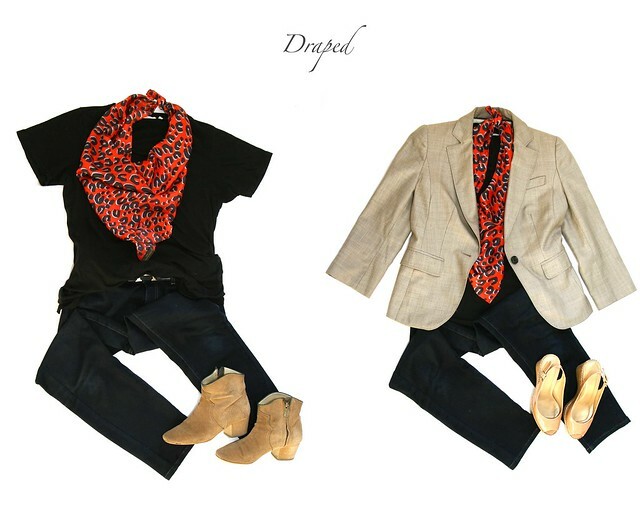 Or simply let it drape and be the focal point of your outfit. A consignment of scarves and shawls have just come in. Click here to check them out. Great ideas! I've never tried to wear the scarves as necklaces but it looks very cool :). Loving the Cheval Sur Mon Carre shawl you have up for auction - what a pretty color way! I love the colour mixes here, I really need to concentrate on pepping up my neutrals with splashes of colour. You are always so creative. I never would have thought to twist them like that. They look really elegant. Thanks for great ideas! I love how you put the outfits together too. Btw, what's the name of the blue scarf of yours? The color is gorgeous! Thank you. I'm so pleased you like them. The blue scarf is Early America. I adore the colour story here. Such pretty, bright shades. I wear my hermes scarf atop my head. Oooh i haven't heard seen it a firm if necklace like number 1 and 2 before, so cute especially #2. Your scarves are gorgeous. Gotta love the vibrant colors and prints of H scarves. On an unrelatedexpert question, do you own any Hermes shoes? I have always wondered if they are comfortable. Alas, all their shoes are on the large side. Far too big for my US size 4 feet BUT I own their riding boots. Super comfortable. I heard that their H sandals and Jumping boots are very comfy too. Love your pairings here, especially the cobalt/ grey/black where the red and pink accents lift the whole thing . I also love doing a scarf necklace , it's great for hot summer Hermes days. Love your pairings! Is that a red LV shawl? I love it! Actually, it's a silk scarf. Really versatile! Hey M! I love that knotted necklace look. Ok, I want you to do a video explaining it! HAHAHA Just teasin ya! Those scarves are gorgeous. This is so creative and a great way to get more use out of scarves. 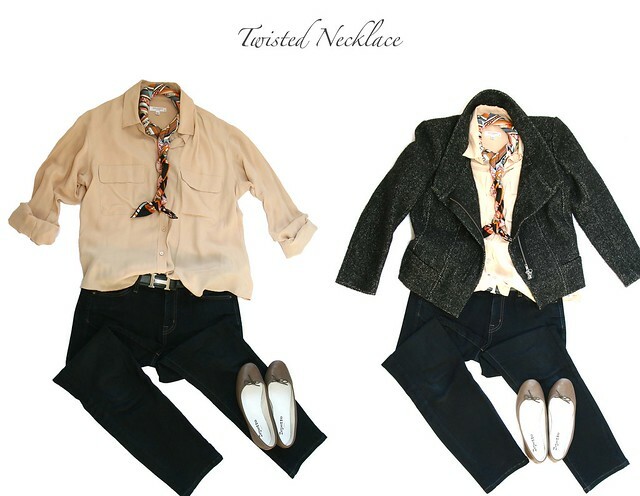 I typically find myself wearing them draped, so I'll definitely have to try out the twisted or knotted styles. Really pretty scarves by the way! Thanks for all the fab ideas M! I usually wear mine draped, but I need to branch out and try them as necklaces too! he'd look like a tall, scary, dirty Biker who caused fights at parties. Scholarships ome in a variety of forms, but are generally considered to be "free money" for college. going too a well-known blogger iff you happen to are not already.